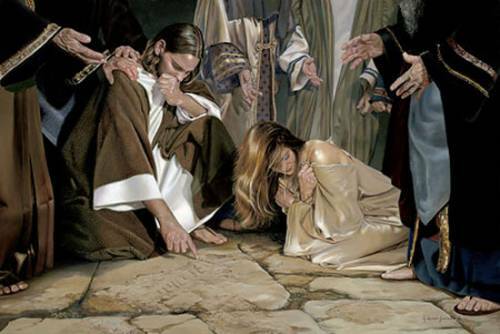 Jesus was teaching at a temple near the Mount of Olives when some scribes and Pharisees brought him a woman accused of adultery. Knowing that he taught compassion as his central principle and wanting to confound him, they said that the woman had been caught in the act and that the Law of Moses demanded punishment. But then Jesus said, "The one without sin among you should be the first to throw a stone at her." One by one the accusers left until Jesus and the woman were alone. "Go and sin no more," he said. I love this story. It represents a point in time when ancient Mosaic traditions clashed with a different, emerging perspective. Obviously, the story is about charity, wisdom and justice. More than that, it's a story of humility and forgiveness. Humility is related to strong self-esteem. In addition to acknowledging your strengths, you remember your weaknesses. You take a balanced, realistic view of yourself. Acting this way isn't easy. That's why humility is a personal strength. I've written about forgiveness before. But this story reminded me that every single day I encounter behavior that causes me to feel the edge of criticism and censure and am tempted to react harshly. But then I realize that I myself have done the very things that irritate me. In other words, I too am imperfect and fallible. I am not "without sin." I've failed to do things I promised to do. I've forgotten to stay in touch with friends. I've closed my mind to opinions contrary to my own. I've indulged in unhealthy foods. I've avoided doing unpleasant tasks. I've avoided acknowledging unpleasant truths. And the list goes on and on. In other words, I'm a mixture of strengths and weaknesses. I have the capacity to do good or ill, just like anyone else. I wouldn't want to be shouted at or put down for such things, but I wouldn't mind having a mirror held up to my actions and being held accountable. I'd want to be forgiven. Every time I've remembered to be humble and to forgive the failings of others, every time I've let my harsh feelings go, I've felt a heavy load lifted from my spirit. And I didn't have to suffer the damage to relationships that comes from acting in a harsh or arrogant manner. Surely these benefits have added years to my life.